The BLOODHOUND SCC (supersonic car) project will take part in South Africa’s National Science Week with a range of activities in Kimberley. National Science Week is an initiative of South Africa’s Department of Science and Technology. Rocket car building workshops kick off at 08:00 every day (Eight workshops per day). The rocket cars will be launched down a 12-m track using an air accumulator as the power source. The workshops will also cover aerodynamics, thrust, different rocket types, manufacture and Newton’s Laws, plus of course Bloodhound design, the World Land Speed Record and why the car will be running in the Northern Cape at Hakskeenpan. Saturday 3 August – BLOODHOUND SSC stand at the Diamond Pavilion Mall in Kimberley, 09:00 – 16:00. There will be information for visitors about the Project and the opportunity to try out the Bloodhound driving experience (BDE). Learners from the MSLA who have been following a STEM communication course will be acting as Bloodhound Junior Ambassadors and informing all visitors about the Project. The BLOODHOUND SCC (supersonic car) is currently being built by a team of about 30 engineers in a high-tech centre near Bristol in the UK. The car will come to South Africa in 2015 for a series of test runs (over several months) to break the sound barrier and the current land speed record of 1 221 km/h. In 2016, it will attempt to set a record 30% faster than that: 1609 km/h, or 1 000 mph. The world land speed record of 763 mph (1 228 km/h) is held by the Thrust SSC team that was also led by Richard Noble and driven by Andy Green. The BLOODHOUND team scoured the globe to find the perfect desert to run the car on. It needed to be at least 12 miles (nearly 20 km) long, two miles wide and perfectly flat. Following an intensive two-year search, Hakskeen Pan, Northern Cape, South Africa was selected as the perfect run site. At full speed BLOODHOUND SSC will cover a mile (1.6 km) in 3.6 seconds: that’s 4.5 football pitches laid end to end every second. 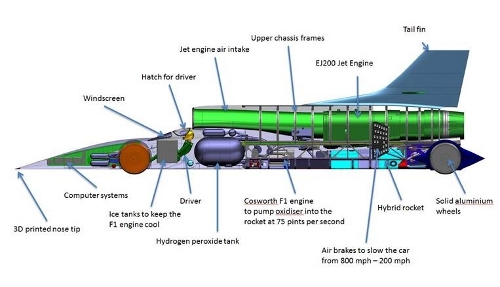 BLOODHOUND has three power plants, a Rolls-Royce EJ200 jet from a Eurofighter Typhoon, a custom designed hybrid rocket and a 750 bhp Cosworth F1 engine that drives the rocket oxidiser pump. Between them they generate 135 000 equivalent hp, same as 180 F1 cars.